Makanyane Safari Lodge was designed by a team of award winning architects to effortlessly blend with the surrounding bush. The relaxed yet luxurious interiors complement the design perfectly, tastefully enhancing the atmosphere of comfort in this idyllic environment. Makanyane Safari Lodge consists of a beautiful main building and eight stunning suites, which lie hidden in the lush forest, offering spectacular views over the tranquil Marico River. Situated on 1,800 hectares of private ground within the 75,000 hectare Madikwe Game Reserve, Makanyane Safari Lodge has accommodation for a maximum of sixteen guests, ensuring that each guest has privacy and individual attention. Located on the edge of a ravine, Makanyane's dramatic main lodge overlooks a stream-filled waterhole shaded by a dense canopy of trees. Enormous ancient Leadwood trees in the lounge and the dining room support the sweeping thatch roof. The spacious lounge area has two rock fireplaces and opens out onto a wide wooden deck hanging over the ravine and waterhole below. On this wooden deck is the well stocked bar with its sweeping roof. Makanyane's gracious dining room also opens onto the vast deck area, perfect for enjoying a meal under the trees while watching game drink below. The main lodge has a curio shop where you can browse for souvenirs, a library area and an extensive wine cellar. Makanyane Safari Lodge has a heated, secluded swimming pool, the ideal place to soak up the African sun, while enjoying the idyllic scenery. 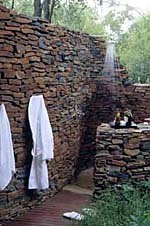 Makanyane's spectacular bathrooms have under-floor heating as well as indoor and outdoor showers. The wide, folding doors can be opened to allow the sounds and scents of the surrounding bush to join you in the luxurious freestanding bathtub. The understated luxury of your suite flawlessly compliments your untamed surroundings. 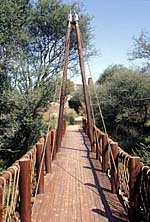 Rustic hides have been placed in certain idyllic locations on Makanyane's private and exclusive land. One of these hides overlooks a waterhole hidden deep in the bush, a favourite place for animals and birds to drink. Another looks over the vast plains, providing observers with an ever-changing view of animals moving across the breathtaking landscape. Those reluctant to surrender to the luxury of their suite can continue their African experience by sleeping out under a velvet canopy pierced with uncountable stars. To allow guests to experience the ambience of the bush at night, beds will be made up on the upper deck of a hide hidden deep in the bush, next to a waterhole. Our overnight hide brings you even closer to the sounds and experiences of the African bush at night.